Network efficiency, speed and reliability rely on optimizing performance and ensuring that the network delivers the highest Quality of Service to its users. This requires identifying, analyzing and classifying traffic so you can shape and control its flow. Allot’s technology helps you achieve this on any network. Allot’s solutions monitor network traffic in real time and dynamically shape this traffic so that it is aligned with business needs and acceptable use policies. Traffic shaping is designed to prioritize business-critical over non critical traffic and the creation of tiered service levels, if needed. The result is an efficient network that increases enterprise productivity. The ability to manage and prioritize network traffic reduces the impact of applications that heavily consume bandwidth, thereby guaranteeing the quality of service you can provide and avoiding a deterioration of users’ quality of experience. By managing bandwidth you maximize the efficiency of your network, your processes and your business. Traffic shaping gives you granular visibility and policy-based control of every IP flow and application transaction on your network, enabling you to favor business-critical applications. Real-time traffic classification controls congestion and adjusts service delivery to shifting network conditions and user requirements. Underlying Allot’s traffic shaping capabilities and facilitating the best QoS for your network, is Allot’s Dynamic Actionable Recognition Technology (DART). DART is embedded in every Allot in-line platform. It combines Allot’s vast expertise in deep packet inspection (DPI) and real-time policy enforcement into a highly effective toolkit for managing bandwidth consumption and service performance. DART can distinguish between different devices that are preferred for different uses. This ability can be instrumental in capacity and service planning, and in strategic decision-making. 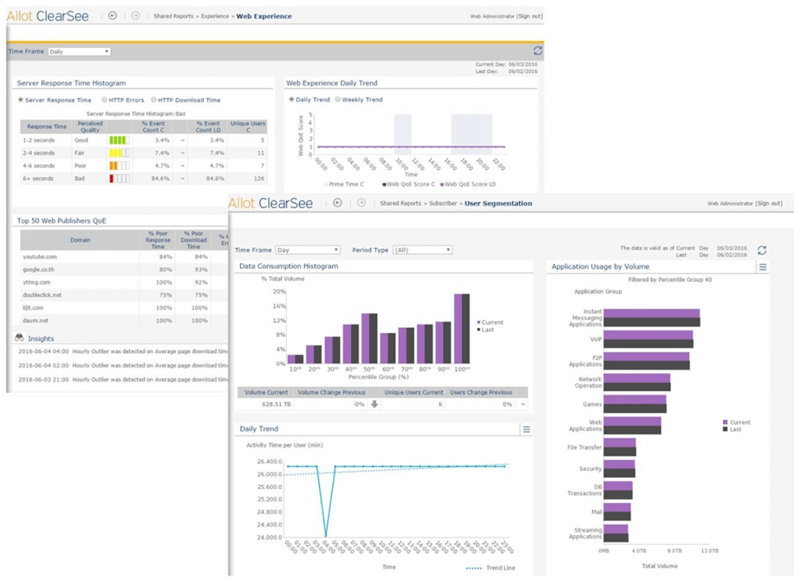 DART also monitors user-application usage and tracks consumption patterns, enabling accurate analysis to support QoS policy enforcement. A central vantage point for management and configuration of Allot SSG platforms, and a powerful control center for network-wide visibility, security and control.